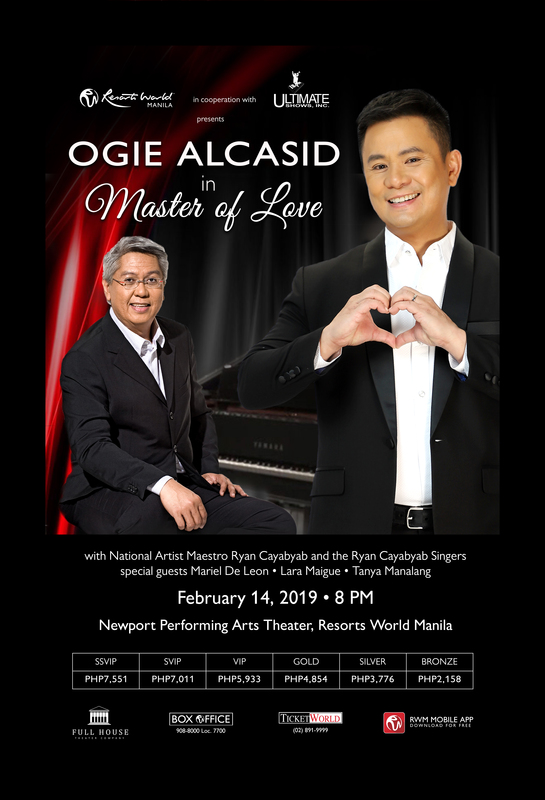 The greatest love songs from the masters of love--this is Ogie Alcasid’s concert on Valentine’s Day. Through these songs, Ogie will be telling many stories of love, the many heartaches and triumphs, including his own. 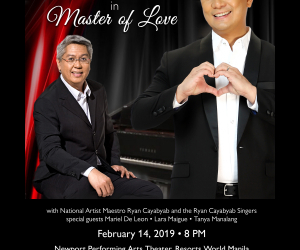 Musical Director for this show is National Artist for Music, Maestro Ryan Cayabyab who has written some of the most iconic Filipino love songs of all time. Maestro Ryan Cayabyab will also be joined in by the Ryan Cayabyab Singers. Highlights of this show include hits from other masters of love, like Basil Valdez, Hajji Alejandro and the late Rico J. Puno. A medley of Barry Manilow’s songs evokes the bittersweet feeling of lost love. A “kilig” suite of mellow love songs from the 80s brings back feelings of love from a more innocent time. Guest stars Mariel De Leon, Lara Maigue and Tanya Manalang join Ogie with their own stories and songs of love. Catch Ogie Alcasid’s “Master of Love” on February 14, 8pm at Resorts World Manila. Tickets are available at all Ticket World Outlets and at Resorts World Manila Box Office.